Our second holiday of the summer was to be a trip to France. 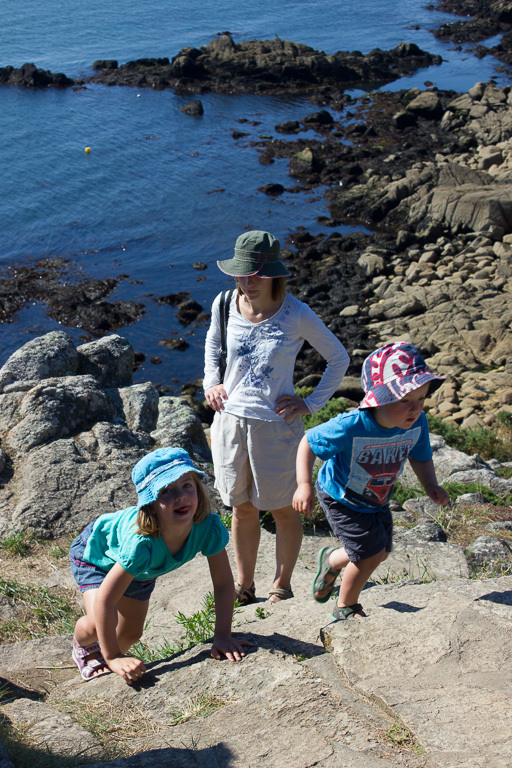 Other than having booked a ferry from Portsmouth to Caen, we had no real plans until Christine started looking at campsites in Brittany with about a week to go. We settled on a vague plan to split the 10 days between Névez and Quiberon, both on the south-west coast either side of Lorient. With our preferred campsite in Névez only taking reservations for a week or longer, we left home without any firm bookings. We avoided the high-speed ferry this time and, combined with a calm sea, the crossing was mercifully uneventful. The drive across to Brittany took longer than I had hoped (with bikes and a new box on the roof the 130km/h limit felt too fast) and we arrived half an hour after reception was due to have closed. Thankfully, it was open all the same and we duly booked ourselves in to a nice grassy pitch. 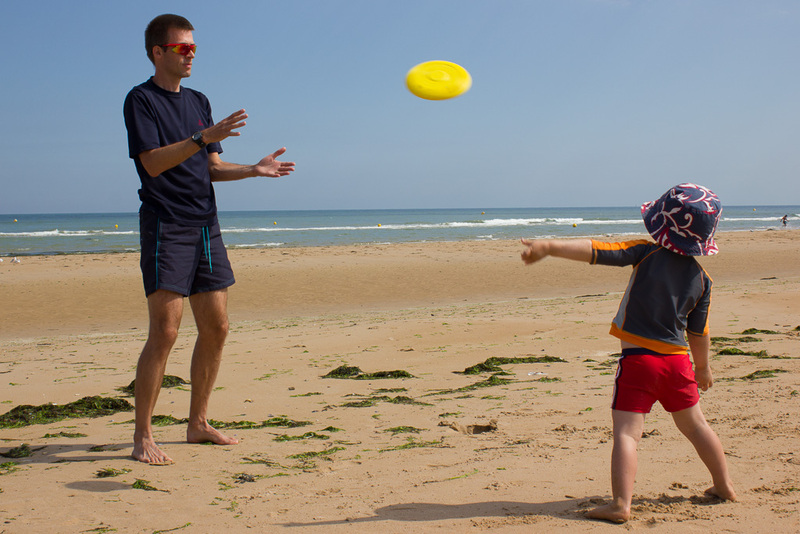 With the exception of the arrival of Christine’s parents in their camper van a couple of days later, each day then proceeded along much the same lines: lazy start to the day, sun shone, , beach, campsite swimming pool, children cycled around campsite, campsite playground, children collapsed in to bed shortly followed by parents. No-one showed any signs of tiring of this routine and in the end we stayed 8 days at Camping de l’Ocean. The campsite was most notable for the lack of British people (a mix of French and Germans with a few Dutch thrown in for good measure). From the sound of it, most of them were in the campsite next door! 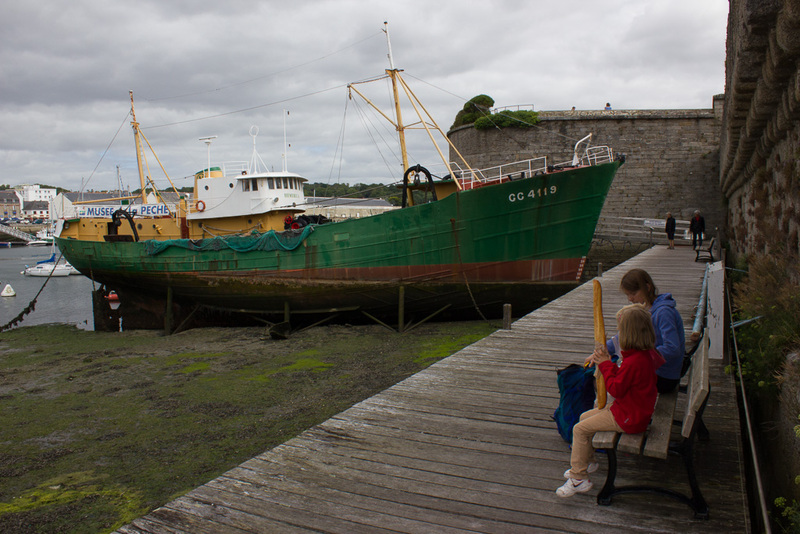 We had just two nights where it rained with a grey day in between where we headed in to Corncarneau and the children had a surprising amount of fun in the Musée de la pêche. For the last two nights we relocated to Normandy so that we only had a short drive back to the ferry. We randomly selected Camping La Roseraie d’Omaha from a guide book (tucked away you certainly wouldn’t have found it otherwise). Unfortunately, Emma was car sick with just 15 minutes to go to the campsite. Thankfully I’d pocketed a few sick bags off the ferry! It was a short drive from the camp site to the beach where I’m afraid we studiously avoided anything WWII related (I don’t think either of the children are yet in a position to really understand the enormity of what happened there). It was a good choice in Emma’s eyes if only due to the water slide by the pool and the ice creams in the shop! We had one further mishap on the return ferry. For some unknown reason, Duncan headed out on to deck when I had thought he was going to join Emma in the nearby play area. He then needed a wee but couldn’t find us again and was picked up by a member of the crew with rather damp shorts… We’d just spotted his absence from the play area when the announcement came over the tannoy and Christine had to pick him up from the pedestal behind the information desk where he’d been placed in full view of the queue of passengers waiting to book a cabin. Thankfully Christine had thought to pack some spare clothes for just such an eventuality. All in all, with the help of some fantastic weather, it was a very relaxing holiday. Christine and I have both had the luxury of a one day working week but next week sees a return to normality with school restarting on Tuesday. This entry was posted on Saturday, August 31st, 2013 at 10:00 pm	and is filed under Family, Travel. You can follow any responses to this entry through the RSS 2.0 feed. Both comments and pings are currently closed.